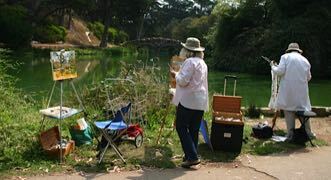 Plein Air Links connects outdoor painters to their local public painting groups in the San Francisco Bay Area and surrounding areas. It has weekly paintout schedules, upcoming events, artist website links, and information about each group. Click on the photos above, or the names below of the outdoor painting group that you want to visit.